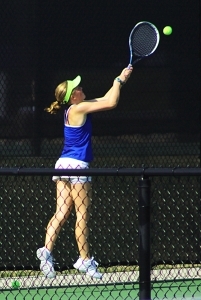 Two-time defending champions Chamblee Lady Bulldogs begin defense of their Class 5A girls’ tennis title on Tuesday as one of 17 DeKalb County tennis teams open first round state playoff in their respective classifications. Chamblee (18-1) opens defense of its Class 5A state title on Tuesday, April 16 hosting Johnson-Gainesville at Sugar Creek Tennis Center at 1:30 pm. The Lady Bulldogs lost their first match since 2016 in a tough 3-2 loss to Lovett on March 19 breaking a 59-match streak that includes two Class 5A state titles along the way. Chamblee bounced back from the loss to start a new streak having won 6-0 in a row including a 3-0 run in the Region 5-5A Tournament to claim another region title with a win over Arabia Mountain in the finals. It is the 10th consecutive trip (2010-2019) to the state playoffs for the Lady Bulldogs. Playing at the same time at Sugar Creek will be the 14-5 Chamblee Bulldogs who are also hosting Johnson-Gainesville following a Region 5-5 Tournament championship win over Southwest DeKalb. Two 5:00 pm matches are set at Sugar Creek as Tucker hosts a pair of matches in the Class 6A state playoffs. The Lady Tigers (16-2) host Houston County in the girls’ state playoffs and the Tigers (11-7) faceoff with Lee County in the boys’ opening round. The Lady Tigers won the Region 4-6A title for a No. 1 seed while the Tigers finished as the boys’ runners-up for the No. 2 seed. In other Class 5A playoff action on Tuesday, Arabia Mountain’s boys’ and girls’ teams travel to Clarke Central for first round play beginning at 1:00 pm at the Athens-Clarke County Tennis Center. The No. 3 seed Southwest DeKalb Lady Panthers go on the road to Loganville for a 4:30 pm start in their Class 5A state playoff match. Other Class 6A state playoff first round play includes the Dunwoody Wildcats traveling to Creekview for a 4:00 pm match. Lakeside’s boys and girls hit the road to North Gwinnett for 3:30 pm matches in the first round of the Class 7A state playoffs. Druid Hills sends both teams to Columbus to take on Northside on Tuesday at 2:00 pm. Stone Mountain travels to Jefferson for both a boys’ and a girls’ match on Tuesday beginning at 4:15 pm. Three Class 5A matches are set for Wednesday with the Southwest DeKalb boys hosting Loganville in a 5:00 pm match at Dottie Bridges.